Sun Circuit is well know for keeping it fun and entertaining all week. We are excited to bring you 3 Exhibitor Parties where you have a chance to enjoy some great food and catch up with your friends. 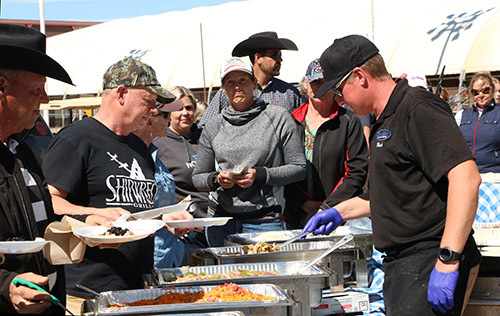 Exhibitors lunch party hosted by AQHA stallions Indefinate, Definitely All That and Tigers by the Tail – Free Lunch served ringside at the Equine Chronicle Arena. Many thanks to 7 Bar Ranch and their great stallions for sponsoring this event! NSBA Exhibitors Appetizer party hosted by Susie Johns and Family- Following last class ringside of the Equine Chronicle Arena. Many thanks to Susie Johns and Family for sponsoring this event! Exhibitors lunch party hosted by AQHA stallions Mechanic and The Mile High Club – Free Lunch served ringside at the Equine Chronicle Arena. Many thanks to Sandra Morgan and her great stallions for sponsoring this event! 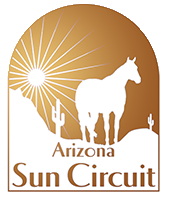 The Arizona Quarter Horse Association is excited to announce the mid-year rankings for Showmanship, Horsemanship and Equitation exhibitors in the lead up to the National Championship Tournament being held at Sun Circuit 2019. Each division lists the individuals who were scored by the committee, as well as those currently leading the pack at this mid point of the show year. However, there are still plenty of shows to go before the final list is compiled and eligible exhibitors to the Tournament are announced. This brand new and exciting Championship Tournament format is creating a good deal of buzz around the show world. The hoopla of the Final Four competitions in each class will certainly be rewarding for exhibitors and entertaining for spectators. Additionally, the overall impact on showing in general could be enormous. The more an exhibitor shows throughout the entire year, the more exposure they have and the greater their opportunity is to be ranked. The lists were formulated by compiling individual rankings from each National Championship Ranking Committee Member. This anonymous group is comprised of judges and trainers who are actively involved in these industries throughout the United States. They were regionally selected to give fair and balanced coverage across the country to rank Youth, Amateur and Select exhibitors in each of the three classes. The Smart Boons Fence Challenge is always a crowd pleasing spectacle of equine athleticism. Smart Boons owners, Eric and Wendy Dunn added $20,000 to the pot and 100% of the entry fees were added back. Twenty of the top cow horses in the nation and their riders put on a fantastic show for the enthusiastic crowd. The energy of the event was contagious as spectators whooped and hollered with each turn of the cow. Scores were held to the end, so the excitement continued to build. Corey Cushing was EmCee for the evening, interviewing each breathless rider after their performance. After several heart thumping runs, Phil Ralls loped in on the flashy roan stallion, Call Me Mitch, owned by Estelle Roitblatt. The pair dominated their cow, diving into the stops, and turning with ease. It was clear they were going to be tough to beat. The crowd also cheered wildly for BJ Avila who was fast and fearless on Dera Cat owned by Rainlynn LLC. Cushing turned over his microphone and hopped aboard Sonita Lena Rey owned by Sheri Jamieson. They too turned in an exciting performance. All 20 exhibitors returns to the arena for scores and awards. Cushing’s run scored a 151, settling them into 3rd place. That earned a check for $3,825. Avila marked a 153 winning a check for $5,100. But it was Ralls and Mitch who edged out the pack with a 154, winning them a check for $6,375 and a beautiful custom Preston Williams Hardware trophy buckle. 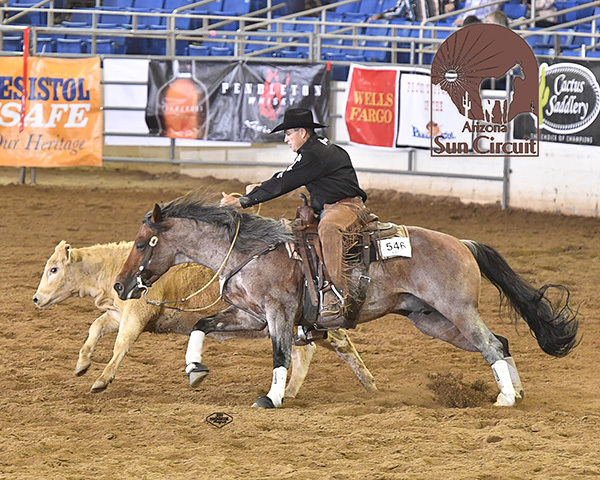 The pair combined that score with points earned in cutting, steer stopping and cow horse to claim the Golden Cowboy Award and an additional $2,250. Sun Circuit hosted the NSBA Riders Cup on March 6 & 7. A total purse of $75,000 was awarded, along with 29 beautiful silver cup trophies and NSBA medals. The annual event is awarded money in Western Pleasure, Hunter Under Saddle, Trail, Western Riding, Showmanship, Western Horsemanship, and Hunt Seat Equitation events. The large trophy cups were proudly displayed all over the barns at WestWorld after the event. Brody Galyean rode Cool Poco Dot in the All Age Limited Non Pro Western Pleasure to score the top marks in a field of twelve. His giant smile reflected brilliantly in the large Rider’s Cup trophy as he rode out of the arena knowing he earned $1,826.15. Keeping it in the family, Kristin Galyean won the Non Pro Western Pleasure and a check for $1,007.06 riding VS Lady in Red. 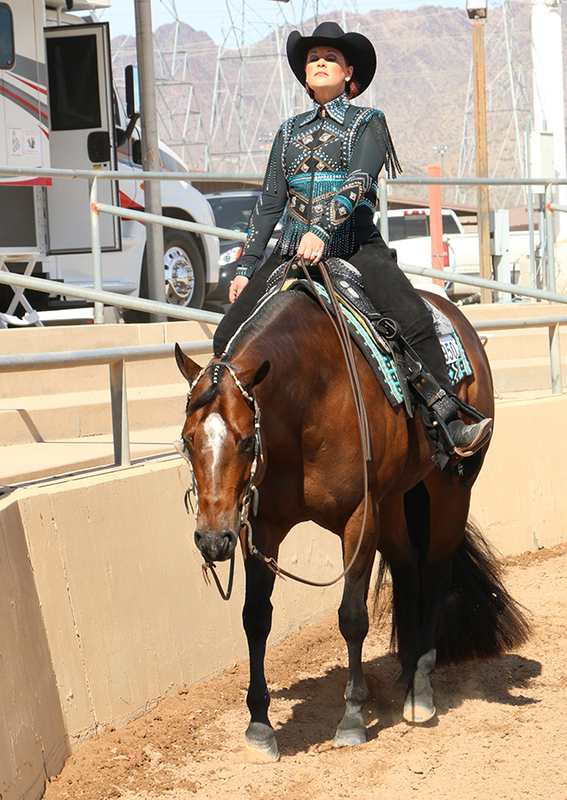 The pair also took the top spots in Non Pro Western Riding and Junior Western Riding, earning an additional $3,257. For those not familiar with the NSBA Riders Cup program, it hosts an annual event designed to award substantial and sustainable purses to NSBA non pro members and their professional trainers. The Riders Cup offers prize money in Western Pleasure, Hunter Under Saddle, Trail, Western Riding, Showmanship, Western Horsemanship, and Hunt Seat Equitation events. In 2016, the NSBA Riders Cup paid over $40,000 in total prize money to participating NSBA members. “NSBA has seen continued growth and participation at horse shows across the country. The Sun Circuit is a terrific West coast venue for a major NSBA event. Holding these two events together is a win-win for trainers and exhibitors,” says NSBA President Bill Cosentino. To take advantage of the opportunity to compete in the NSBA Riders Cup, all professional riders must be sold through the NSBA Trainer Sale program. Additionally, each owner is required to pay a nomination fee. 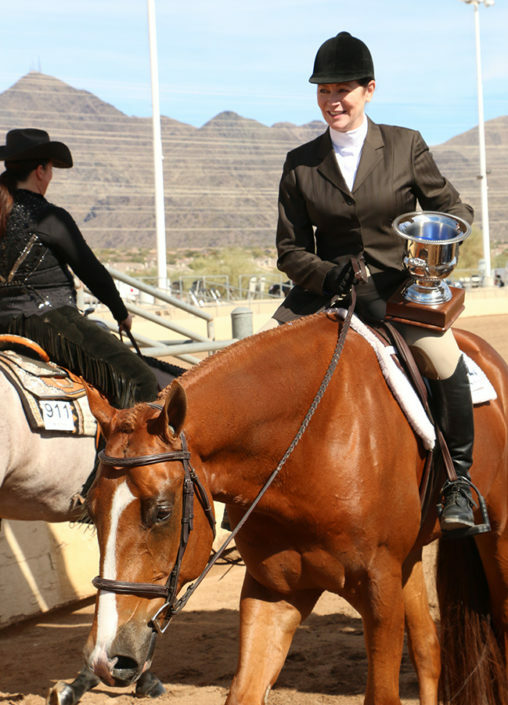 For more information on the NSBA Riders Cup and the Arizona Sun Circuit go to www.nsba.com.